I get way too much credit. Really. For nearly everything. This is not a statement of modesty. It’s just a fact. But I have only come to realize it recently. What brought this to my attention was a project that my wife and I have recently tackled. It’s a property on Main Street in Coshocton that we purchased at the end of last year. Since then, work has been being done to improve the property and (we hope) the downtown as well. But here’s the thing…I haven’t been doing any of it. My wife has. She (with the help of my daughters) has been tearing up carpet, taking out cabinets, cleaning, painting, working with contractors and more. They have been working their tails off and making great progress…and I am very proud of them. So it always catches me off guard when someone comes up to Amy and I and asks ME about the project. “How is that coming?” Or “Really appreciate you taking that project on.” That’s great…and I appreciate the sentiment. But I am not doing it. I am just getting the credit for it. Is it because I am the guy?Is it because I am the mouthpiece?Is it because I am the constant, narcissistic self-promoter? Wait. That last one hurt. Amy deserves all of the credit for the project. She is doing a great job. 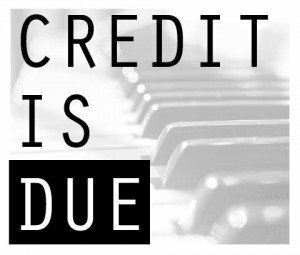 And it made me think of the other things in my life where I get all of the credit…unfairly. Do you enjoy videos we do like Delivering Marketing Joy? If so, Dustin Haywood deserves credit. He is our video guru and makes me look good. Do you like the graphics and look of our marketing? Then you need to give Josh Williams a pat on the back. That’s all him. Happy about the fact that we pay the bills and invoices get moving in a timely fashion? Libbie Granger-Prince handles all of that. And if you have ever had me actually make it to an appointment, or an order made it through the process, then Emily Bradford deserves credit for that. Oh…and one more…if you like the beer at Hasseman Brewing, Robbie Kehl does the work behind the scenes there. It’s humbling to have such a great team of people making me look better than I deserve. So thanks to them…and to our awesome sales team too. That’s where the credit is due. Make sure you never miss an update. Sign up for our VIP newsletter here for all of the content!